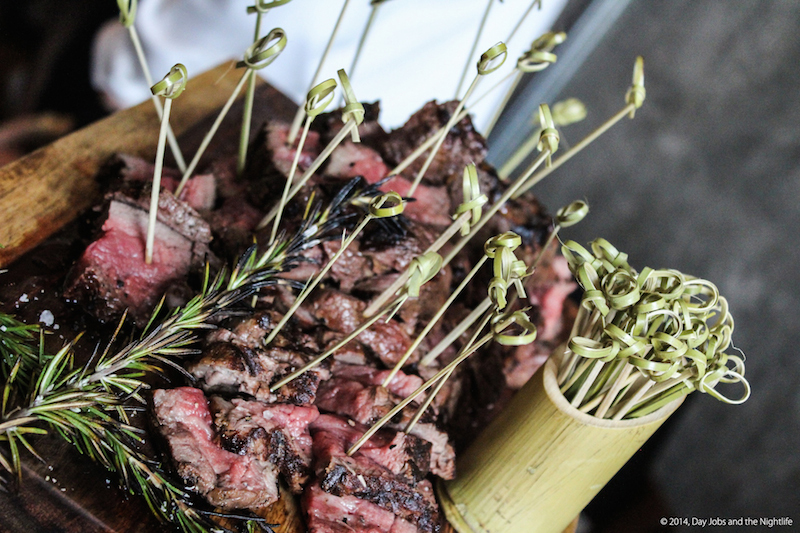 Montrealers take their steak very seriously so it’s no wonder that when Vertigo held its VIP opening event a few weeks back it was standing room only for most of the night. 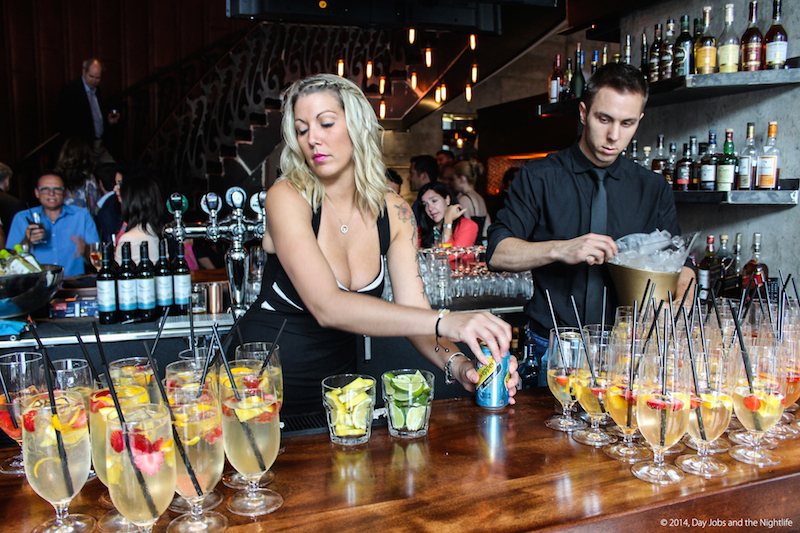 Jam-packed with local celebrities, excited foodies and an exclusive selection of Montreal’s socially savvy media, the night launched Vertigo into Montreal’s ever-expanding kaleidoscope of great places to cool off with a great drink and delicious food. 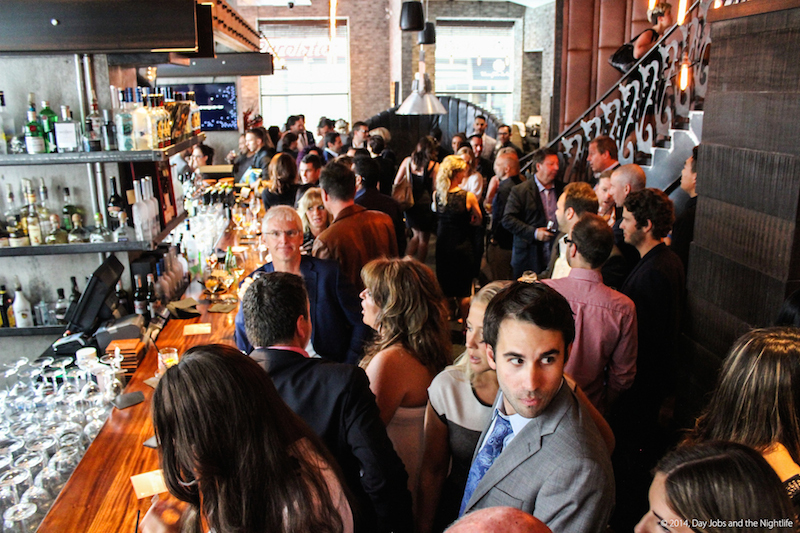 Here are a few thoughts on the new restaurant and the mega opening night. 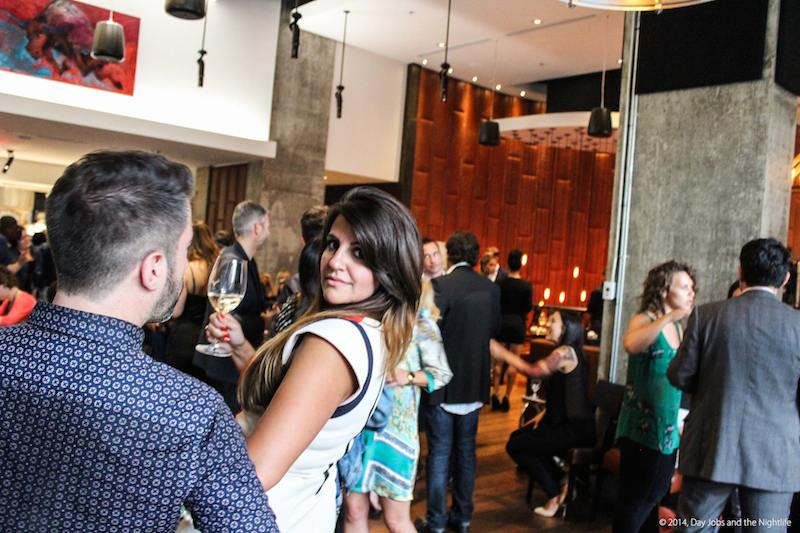 Weeks before the opening event, DJNL snuck into the restaurant on a quiet Wednesday afternoon to get a peek at the freshly opened, two floor restaurant in one of Montreal’s newly constructed condo towers. Just one street south of St. Catherine on University, the relaxing rich scent of leather and wood are the first things to rev the senses as you walk into the sprawling steakhouse. The atmosphere as you might guess is immense in nature with a spacious lobby downstairs and a near limitless dining room and an outdoor terrasse upstairs. The lobby (first photo, above) is a great place to start your evening with a drink or a quick bite. Large wooden blocks and supple leather seating anchor the décor. The use of raw materials adds a cozy element to restaurant and the spacious bar has a great view onto the street for people watching. Several tables dot the main floor and a private dining room is available for functions. Moving up past the custom-made wrought iron railing and wooden stairs (not sure I love the railing but it does fit the décor quite well), the soft brown leather is repeated in the lofty second floor dining room which looks out onto Place Ville Marie and along Cathcart Street, has ample room to comfortably enjoy your evening. Both sections of the restaurant have ceilings that reach to the sky so careful looking up; the place is named Vertigo for a reason. The media event was as delicious as the food we tried. 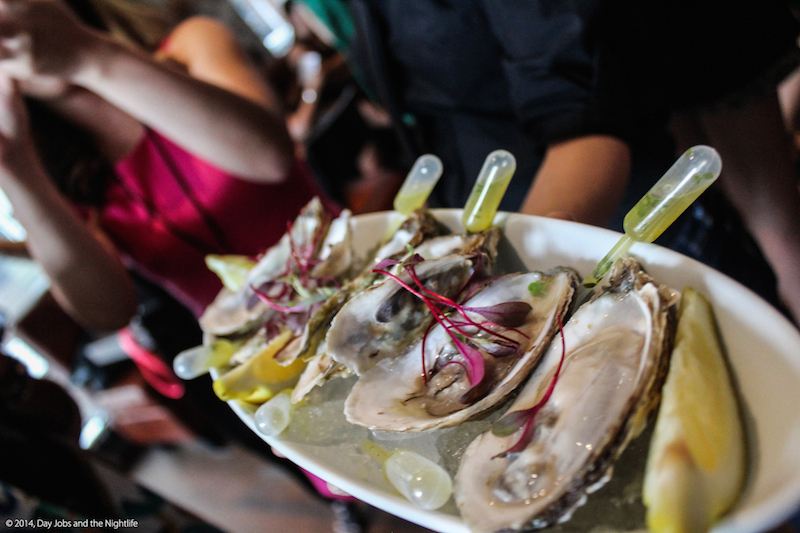 Vertigo pulled out all the stops to celebrate its arrival on Montreal’s incomparable restaurant scene, starting by rolling out the red carpet for their guests. We mixed and mingled with media friends in the restaurant lobby’s many nooks and crannies before moving upstairs to the VIP lounge where we snapped up pictures with some very colourful celebrities and some of our favorite stylish trendsetters. Wine, beer and spirits flowed freely all night as we sampled some of the food the restaurant will offer. Seafood, steak and other treats came out of the kitchen at break neck speeds to over a hundred hungry guests. The waiters and waitresses seemed to be having as much fun as the rest of us as they joined in the fun with laughs and picture taking. Though we have yet to fully enjoy a sit down meal, Vertigo already seems to fit in well with the rest of downtown Montreal’s untameable spirit. If the restaurant’s first weeks are any indication, Vertigo will become one of downtown’s destinations for everything from busy lunches to post work 5a7s and beyond. The stakes for new restaurants in our city are high but Vertigo seems already set for the challenge.